5 point star lamp in green with paper-backed cut outs. 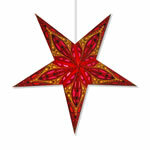 5 point star lantern in red with yellow filigree style designs. 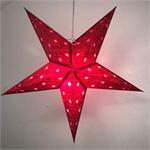 5 point star lamp in red with paper-backed cut outs. Blue star lamp with yellow smiling sun cutouts. 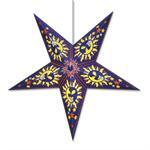 5 point star lantern in green with yellow filigree style designs. Peacock design 5 point paper star lantern in red. Five point star lamp with hearts and flowers. 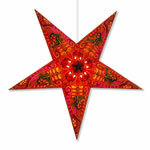 Brightly colored star with Om cutouts. 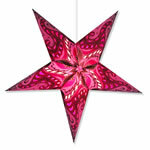 5-point paper star lamp with batik paper. 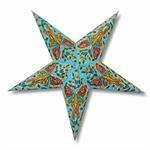 5 point star lamp in rich blue color with paper-backed cut outs.